An exception to the boom is the local office of the U.S. Agriculture Department, the dispensary of federal payments to farmers from an array of arcane programs with names like "loan deficiency" and "milk income loss." On a recent afternoon, the parking lot in front of the squat brick building behind a Chinese restaurant was nearly empty. 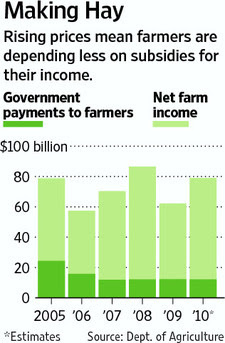 The reason: Payments from America's primary farm-subsidy program, dating from the 1930s, have stopped here. Grain prices are far too high to trigger payouts under the program's "price support" formula. The market, in other words, has done what decades of political wrangling couldn't: slash farm subsidies. Farmer groups, resigned to deep cuts, are pitching alternative subsidy programs that they say would cost taxpayers less. That is a matter of concern to some. While the current crop prices mean subsidy checks aren't much missed by farmers, some agricultural economists worry about what will happen next time the historically volatile farm economy contracts. For decades, while crop prices languished but operating costs rose, many growers counted on these subsidies to survive. For most of their careers, farmers in Shelby County, 200 miles south of Chicago, depended on government payments for roughly half of their income. Today's target prices reflect the largely depressed crop markets that prevailed from the late 1970s until 2005—corn averaging roughly $2 a bushel year after year, and soybeans around $6. But corn now sells for about $7 a bushel in Shelby County, far above the subsidy program's target price of $2.63. Soybeans fetch about $13 a bushel here, versus a $6 target price. So no price-support checks are going out. The other major subsidy program, unrelated to market prices, is a remnant of a failed 1996 experiment by a Republican-led Congress to wean farmers off federal aid. Farmers were supposed to receive fixed, but declining, checks for seven years and then be left to the whims of the market. But in the seventh year, instead of letting the payments expire, Congress turned them into a program of set payments, based on the amount and type of crops that particular farms had historically produced.